Here's how to do it properly. Getting out of bed to exercise -- whether it's a run, bike ride to work or quick HIIT session -- is a rewarding, yet often difficult, task. Pressing 'snooze' is tempting, but nothing beats that post-exercise buzz. Well, here's something which will help you get out of your incomprehensibly comfy bed: a slight tweak of your breakfast timing can help you reach your fitness and weight goals. Tempting, right? They're called fasted workouts, and they are just as they sound -- exercising in a fasted state (so, on an empty stomach before eating breakfast). However, there are some rules around fasted workouts, so it's important to know how to do this properly. "The benefits of a fasted workout include increasing aerobic capacity and increasing the fat utilisation (the use of fat as a fuel source)," Jessica Spendlove -- accredited practising dietitian, accredited sports dietitian and nutrition consultant -- told HuffPost Australia. The most practical time to do a fasted workout is in the morning, before breakfast, but they can be done later in the day. "Morning fasted sessions are the most common, and often most preferred and convenient time, to do a fasted workout," Spendlove said. "Technically, if you train in the evening and you haven't consumed anything since the morning, that could also constitute a fasted workout, but it would be very difficult and I would not recommend that." According to Chloe McLeod, accredited practising dietitian and sports dietitian, people doing double training days may be completing fasted workouts without intending to, even if they're fuelling before the later session. "This would depend on how much is being consumed, but a fasted workout in the afternoon can sometimes be more effective if it's a double training day," McLeod told HuffPost Australia. If you do multiple intense training sessions a day, you may be doing fasted workouts without knowing. "As an example, you're training for a triathlon and you've done your morning training session, and you've got another training session later in the day -- a swim and a cycle. "What can happen is, if the first training session has been tough enough, the person hasn't been able to replenish all the carbohydrate which has been used in that session. Even if something has been eaten, you're still training with 'low carbohydrate availability' and this has the same benefits of doing a fasted workout." Basically, it just comes down to timing, portion of food and what other physical activity has been done. There is a science to fasted workouts and there are certainly do's and don'ts -- depending on your body composition goals, health and the exercise being performed. "There are certain people who benefit more from fasted workouts than others," Spendlove explained. "I would not recommend a fasted workout for anyone trying to gain muscle mass or trying to improve their anaerobic capacity." This is because weight training while fasted can increase the likelihood of using your muscle proteins as a source of fuel, which will give you the opposite effect of what you want. Fasted workouts are better suited to shorter cardio sessions. "If you're going out for a session where you need to put in your maximum effort, or if it's a longer session, I wouldn't recommending fasting either," McLeod said. "This is because it's going to put strain on your body, you're not going to be performing at your peak, and it's going to make it more difficult to recover well as you're more likely to end up sorer after the session, which can have an impact on other training sessions." According to McLeod and Spendlove, fasted workouts are best for short steady state cardio sessions. "If you're going out for a short morning run or doing 45-50 minutes at a steady pace, then you can do this fasted easily," McLeod said. Fasted workouts are most beneficial when trying to increase aerobic fitness, but are still not appropriate for all aerobic sessions, Spendlove explained. Avoid doing fasted cardio for longer than 90 minutes for experienced people, or more than 60 minutes if you're new to physical activity. When you get home, aim to eat breakfast within 20-30 minutes after you've finished your training session, and have a mix of lean protein and good quality carbohydrates. "Some high intensity workouts which are shorter in duration and are more cardio-based can also be useful to do fasted, but they do need to be about half an hour. More than that, you'd want to be eating something beforehand," McLeod said. "When it's really high intensity, your body is going to use more carbs as fuel, so you're going to deplete that storage in your muscles much more than lower intensity sessions." 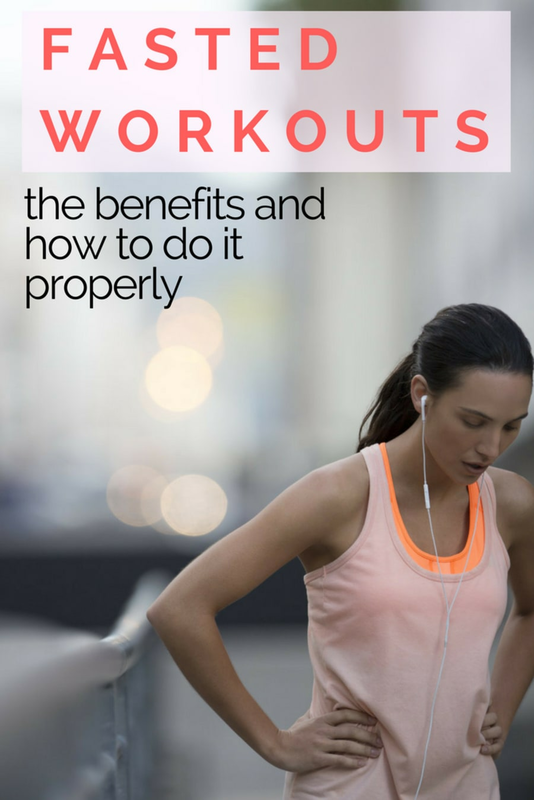 Essentially, there's a fine balance between fasted workouts being helpful and compromising your workout. Consider consuming a black coffee one hour before training in a fasted state (no milk or sugar) to maximise output during the session. If you are trying to gain muscle mass, you should not do a weights session fasted. Fasted workouts are also not suitable for those with medical conditions. "If you're somebody who's got a medical condition, or can suffer from low blood sugar levels, I would certainly be checking with your doctor before starting to do something like this. The last thing you want is to be out and something bad to happen," McLeod said. Once you've come home from your fasted cardio session, fuelling your body is extremely important. "When you get home, aim to eat breakfast within 20-30 minutes after you've finished your training session, and have a mix of lean protein and good quality carbohydrates," McLeod told HuffPost Australia. Eggs on whole grain toast with avocado and veggies is perfect post-workout fuel. "This could be milk with muesli and fruit, or a smoothie with milk, banana and oats, or eggs on toast. This means your muscles can refuel and your muscle proteins can help with recovery and regenerating." For post-workout nutrition, Spendlove also recommends an omelette with a slice of rye toast or an acai bowl with added protein powder. "And always [drink] some water to replace fluid losses."